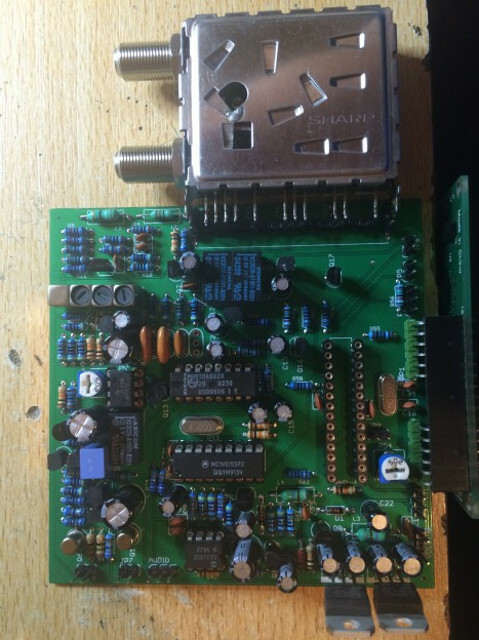 I owned an homebrew analog ATV receiver bought from PE1ACB for A while now and was very pleased with the good quality of the video signal. The only thing I didn’t like was the way you had to control the receiver with only the frequency setting on an LCD and A rotary encoder for adjusting. All other options where set with switches and an pot-meter. 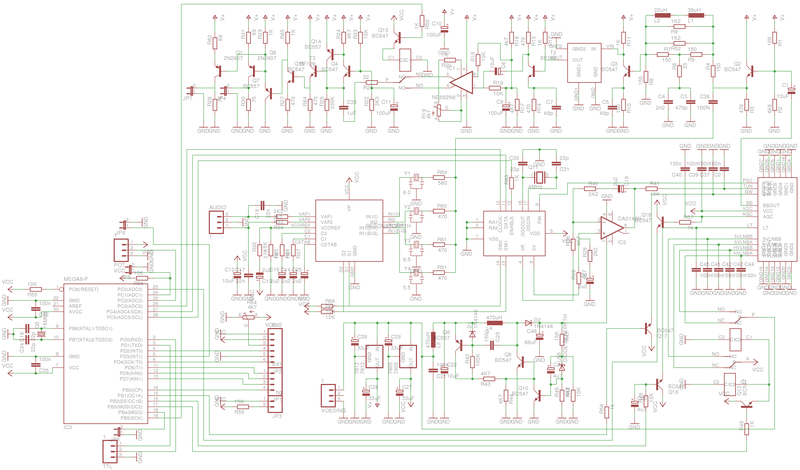 It took me some time to figure out how the pll (mc145155p2) had to be controlled but I managed to figure it out. The video and audio demodulation was also published by PE1CHY, if someone can deliver me the link I will post it here. Once I got the pll software running on an arduino rom based atmel chip I was able to build more software options. I also added the option to adjust the local oscillator setting so you can read out the frequency plus or minus the LO of the LNB or converter. 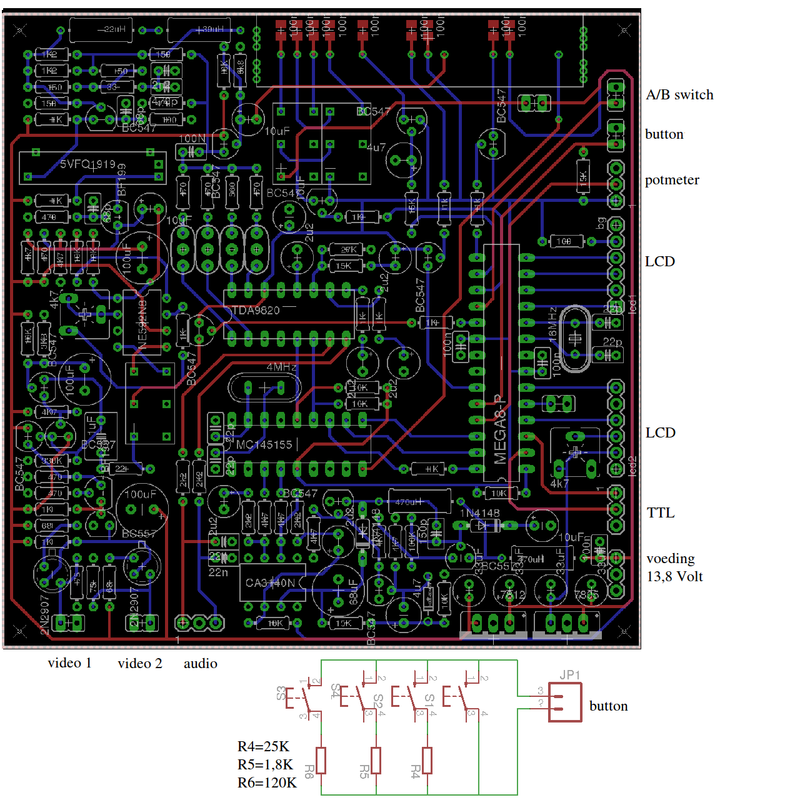 I had to design A new PCB for the extra hardware and the micro controller I wanted. audio carrier 5.5, 6.0 and 6.5 MHz (stereo in combination with 7.02 MHz). there are 4 buttons connected to the board to adjust the parameters. Next to that there is also the possibility to connect A pot-meter to adjust the frequency from set frequency to 500 MHz up. And an option for input A/B switch, I did this in the menu but I noticed it’s faster to have A switch for this function. Al the above menu settings will be stored in EEprom separate for input A and input B. This means you can use the receiver for 2 bands and just flip the switch to get from 3 cm to 13 cm.